My Wedding Teddy – Groom has super soft fur and is 50cm tall (32cm sitting). This teddy is dressed in a smart vest and bow tie. 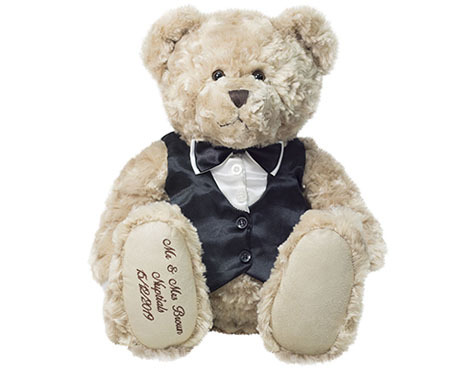 My Wedding Teddy – Groom is customised with the couples names and the date of the wedding embroidered onto the pad of the teddy’s right foot. Your My Wedding Teddy will arrive with its own Wedding Certificate (Please note, our standard certificate is a bride and a groom. If you need a different certificate please let us know in the order notes section), beautifully wrapped in tissue paper and packaged in a special box. Your teddy will be dispatched within 21 days on our STANDARD Delivery service (Generally delivered within 28 days*), or you can select our PLATINUM service delivery for dispatch within 5 business days (Generally delivered within 14 days*). You can also order this bear for an INTERNATIONAL delivery, your bear will generally be delivered within six weeks*.